Happy New Year, Team PCA! I’m kicking off the new year with a review. You probably received some solid sweaters from Grandma for the holidays or you just went to town during all of the sales, either way there are some new items coming to the closet. For me, when something comes in the closet, a couple of things have to come out. I have a reach in closet in my bedroom, so space is limited. Now normally when decluttering the closet, I give to a local thrift store, do a clothing swap with friends, or I talk myself into saving it for a rainy day. This time, I decided to try something different – enter Thred Up. This site is my first venture into online consignment. There are a ton of online consignment stores and apps popping up. I chose thredUP because a colleague of mine had a great experience shopping with them and the site looked easy enough. I’m no stranger to consignment. I used to consign clothes in college, at an awesome little boutique on Franklin St. I would gather my wares and truck them up from South campus and see what they would take for the season. Everything had to be neatly pressed and showroom ready. This process was and is for the birds. With Thred UP, the process is easy. Go online, create an account, and order their “Clean Out Bag,” and get to work. I dropped off a full bag to my local FedEx Kinkos on a Sunday, received confirmation of receipt of the bag a couple of days later and then waited to see what they thought of what I sent them. Easy process to send clothes – no ironing, no tagging or hanging up. Just put the clean clothes in the bag and send. Done. Links to PayPal account – If you don’t want to spend your cash on more things to go into your closet, then you can get them to put it in your PayPal. Better than getting a check or store credit. Online Promotion – If you have friends that are willing to buy your things, then share your thred UP store link. I leave all of that up to them but you can promote your closet if you want. There is some incentive to share your thredUP link though – the longer it takes to sell, the price of the clothes goes lower. Wait for it… No really, the wait for things to get into the system is like 3 weeks. Granted this is due to the popularity of the site but still. It’s time to hire some staff if you can’t keep the timeline to the 7 days you say in your email. Along with the wait to get items on the site, waiting for it to sell takes forever. My dress is how much? It’s consignment, so you go in knowing you’re not going to get full value but it still stings to see a Banana Republic wool dress go for $50, of which you get $25. I know I got my time out of it but it still feels like a bit of a stretch. Think long and hard about what you’re putting in the bag. If you want the most bang for your buck, go ahead and put that handbag that you don’t use anymore in there. If you’re seeing that your closet is more t-shirts or cardigans, just donate them. You don’t get much for those items and the warm fuzzies you get from that will cover the cost of gas you would spend going to drop off the bag. Don’t be afraid to promote your bag. If you have decent stuff in there, go for it! It helps to get your store front and center and allows you to cash in sooner. 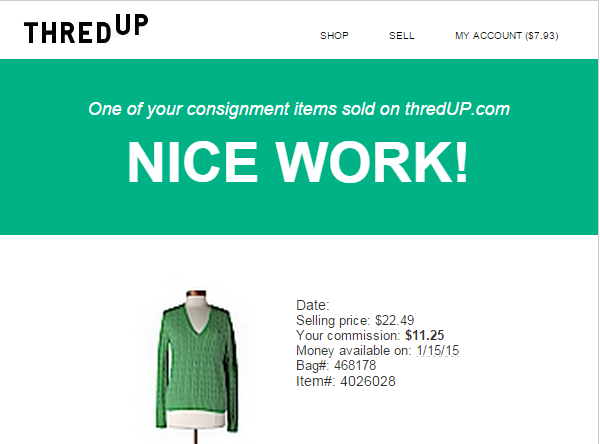 thredUP is a slow burn, but putting a little extra umph behind it, helps speed it up. Be seasonal and designer. This works with tip #2, as well. If you are super on trend and just blow through clothes, send them the things from the first half of the season that you might not wear anymore.